After the 9th-century Danish invasions and 10th-century reform of monasteries, the kind of decoration seen in earlier manuscripts such as the Lindisfarne Gospels becomes rare. Later Anglo-Saxon manuscripts have more solid-looking ornament and figures which are distinctive but inspired by art from the Continent. Although it is missing several of its original pages of decoration, the Bury Gospels exemplifies late Anglo-Saxon book art in a deluxe form. Inscriptions on a few of its pages indicate that in the 11th century it was at Bury St Edmunds, a monastery founded to keep the relics of Edmund, the martyred King of East Anglia. Despite its name, the style of the Bury Gospels' decoration suggests it was made at Christ Church, Canterbury. 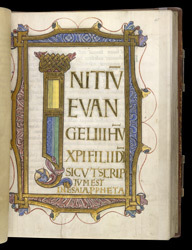 Royal interest in Edmund's relics--which gave Bury a high status--could have brought it this lavish gospels. Originally the Bury Gospels would have had a portrait of each evangelist (author of a gospel), which was the usual arrangement in a decorated gospel book, and the first words of each gospel would have been decorated and written with grand, golden capital letters. Only the beginning ('incipit') of the Gospel of Mark survives. The shapes of the letters, with their disciplined lines and right angles, and their placement on the page, leaving clear space around them, gives a sense of dignity and orderliness. The style of the letters has roots in manuscript art from the Continent, going back to the time of Charlemagne, and before that to ancient Rome. The liveliness of the plant and animal ornament, drawn with energetic lines and shaded and highlighted in rich colours, is typically Anglo-Saxon.